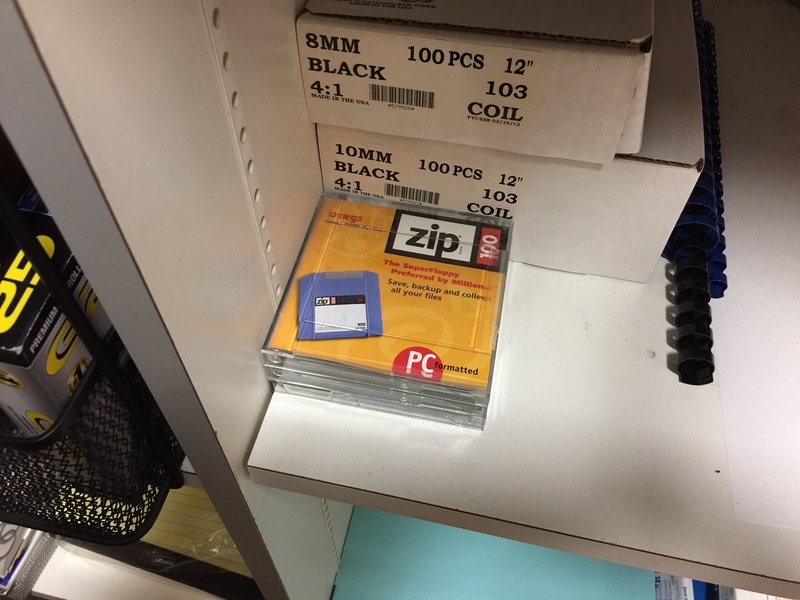 Today, when I was looking for file folder tabs in our supply room, I noticed in the very front of one of the shelves stack of three Zip Disks, 100MB, still in the protective shrink-wrap, like new. I am not sure how they got to the front of the supply cabinet, but there they were. I started the company in 1993, a full twenty-five years ago. Zip Disks were “super floppies” with high capacity, great in the years before Windows 95 even, when we were still working with Windows 3.11 (Windows for Workgroups). They were made by Iomega, and first came out in 1994 with the 100MB version. Later they had larger versions, with 250MB and then even 750MB. The ones on our shelves were the early type, with only 100MB. I still remember buying a zip drive for my main computer, in 1994, when I was the only employee. It felt like heaven to be able to store 100MB on one drive for backup purposes. I imagine I went to the “computer store” and bought a box of the disks just for good measure. Somehow, through all the years, and the many office moves, and several office managers responsible for the supplies, and hundreds of current and former employees, these three Zip Disks survived, unscathed, in the front of our supply cabinet. Nobody ever thought that they were older than the Internet. Nobody ever thought that our company hasn’t had any working Zip Drives for at least 20 years. And then I threw the disks in the trashcan. Good bye, old friends.